A boat patrols the water near Park Avenue Beach Park in Highland Park. Officials confirmed Tuesday evening the missing kayaker is not a NU student. 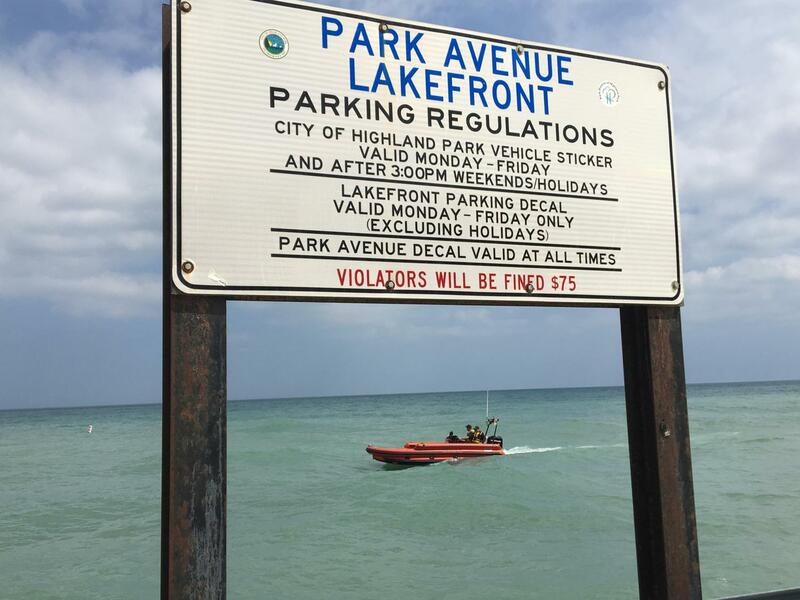 The 20-year-old male reported missing after his kayak overturned in Lake Michigan late Monday is not a Northwestern student, a Highland Park press release confirmed Tuesday. The release identified the missing kayaker as Sebastian Duncan from Glenview, Illinois. Neither Duncan nor the individual who reported him missing are Northwestern students, the release said. The Coast Guard has suspended their search for a missing 20-year-old male after his kayak overturned in Lake Michigan near Highland Park late Monday, Coast Guard Petty Officer Adam Frey told The Daily. Frey said local authorities are planning to continue the search until around 6 p.m. Tuesday evening. Duncan was reported missing at around 10 p.m. by another kayaker who swam to shore after their kayaks overturned, Coast Guard Lieutenant Paul Grotelueschen told The Daily. The Coast Guard, Highland Park and Lake Forest police searched the shores with a small boat and helicopter until 2 a.m. Tuesday, Grotelueschen said. Marine units from the Highland Park Fire Department and Lake Forest Fire Department assisted the Coast Guard. Grotelueschen said the “first light” search was delayed Tuesday morning due to a storm cell passing through the area. He added that the Coast Guard launched two helicopters to help conduct the search in the Lake Michigan area. “We search as thoroughly as we can with the information that we have and try our best to make sure we’ve fully saturated the area,” Grotelueschen said. This story was updated at 4:50 p.m. on August 28 to reflect the identity of the missing kayaker. The missing male is not a Northwestern student. The Daily regrets the error.